Sheds are a wonderful way to store items without messing up the garage; however, old sheds can quickly become a useless eye sore. 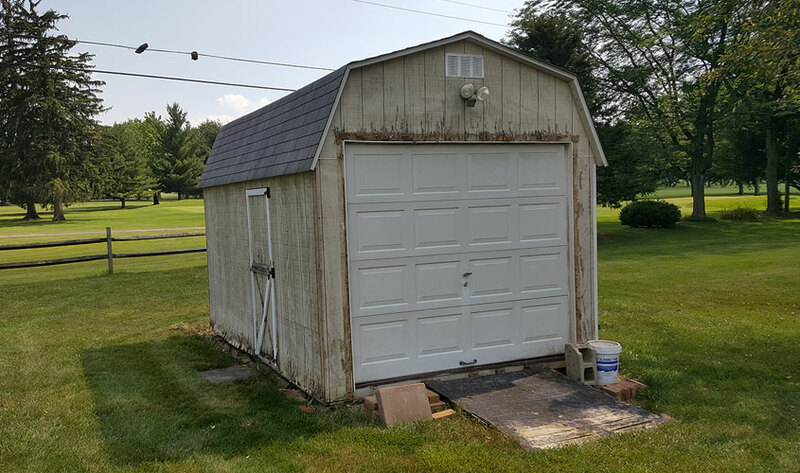 Our professionals at Glick Woodworks offer a shed removal service in PA, MD, and NJ, making it possible to get rid of your old, unwanted shed and make room for a useful storage building. Glick Woodworks charges between $250.00 and $350.00 for the shed removal process. This price varies according to the condition of the structure. The low price makes storage shed removal an easy reality for most individuals. Once the building has been removed, the area is then clear for another unit to be installed. We will come and perform old shed removal by taking your shed from its current location and replacing it with one of our beautiful, new sheds. If foundation work is needed to install the new shed, our workers will generally set the old shed aside, then put down the foundation and install the new shed. Generally, approximately 4-5 inches of topsoil is removed and the area is then filled with stone. In areas where the foundation is not level, Glick Woodworks offers a wooden perimeter to hold the stone in place. The foundation will be approximately 1 foot larger than the new shed on all sides. The professionals at Glick Woodworks want your yard to be beautiful, so we work with a mini excavator so that the area will not be damaged. This is unlike some removal services that choose to use large trucks. To keep the area in top condition, weed control is also an option. Dealing with an unwanted shed is no longer necessary! With Glick Woodwork’s quick and easy shed removal, you won’t have to worry about tearing the building down yourself or dealing with the mess. Don’t put up with an old, unwanted shed that lowers your property value; instead, contact our professionals at Glick Woodworks and let us help you improve your life with easy storage shed removal!